Hall Crane Drivers push back at PMA for removing 63 qualified crane drivers from Supplemental Crane Board, to give more work to steady men. The Hall men are fed up with being pushed around by steady men Union Officials and their buddies, the steady men Employers at PMA. The Complaint is 32 pages long, including all the attachments, and can be viewed by clicking the hyperlink at the end of this post. According to Local 13 Bulletin #35-15, effective 8-8-15 “the Employers” violated Section 13.3 of the PCLCD, when they unilaterally and prematurely removed 63 “qualified” crane drivers, including Carlos Meza #130862 & Lee White #130783, from the Supplemental Crane Board, allegedly using the “Local 13 Crane Training Supplement” as their justification. The “Local 13 Crane Training Program” is a Tentative Agreement signed the same day as the PCLCD Memorandum of Understanding, February 20, 2015, but it was NOT included in the MOU. The “Local 13 Crane Training Program” is a subterfuge created to give more hall work to the steady men, who as of August 8th can take jobs ahead of the 63 qualified but not trained men who were removed from the Supplemental Crane Board, while attempting to buy off the hall crane boards with a guarantee of 10 hours of crane pay Monday thru Friday, if they work other than crane jobs. The Local 13 Crane Training Agreement changes the wages, hours, and working conditions of both the hall crane drivers and the steady crane drivers, but is not in the PCLCD or the Local Port Supplement, just like the $55 per day paid to the dayside steady men. The Employers have been gimmicking the pay given to steady men for years by paying the dayside steady men $55 per day, under the table. The “Local 13 Crane Training Program” is their latest gimmick, and a subterfuge that violates the Section 18.1 Good Faith Guarantee, and places restrictions on longshoremen that are in conflict with the provisions of the February 20, 2015 Memorandum of Understanding, as ratified by both PMA and the Union. 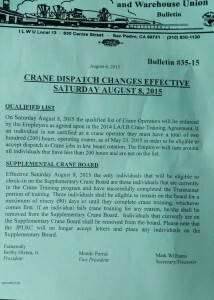 The alleged “Local 13 Crane Training Agreement” is not signed by any Local 13 Officers, or any PMA members of the LA/LB JPLRC, was not printed in the Dispatcher as part of the MOU, was not put into the Los Angeles/Long Beach Crane Operator Addenda of the PCLCD, and has not been mentioned in any CLRC Minutes. 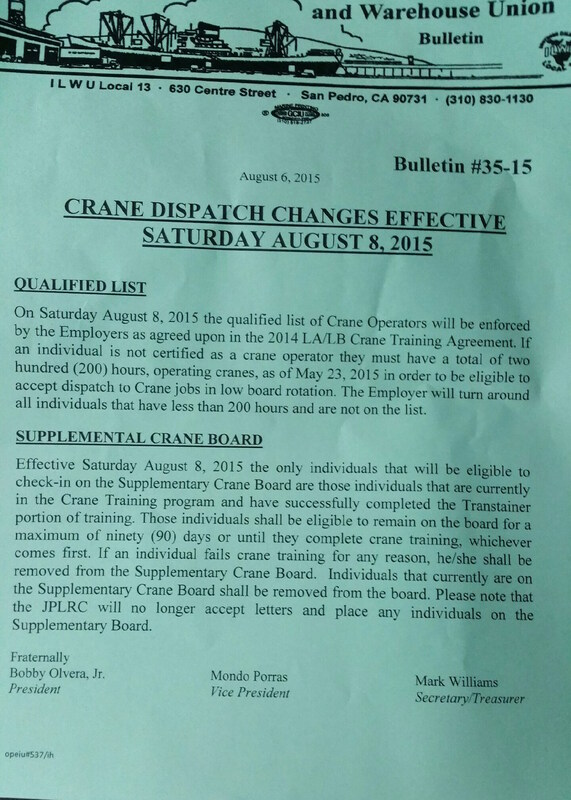 Effective August 8, 2015 the Employers unilaterally removed 63 qualified crane drivers from the Supplemental Crane Board in violation of item 2 of the Local 13 Crane Training Agreement. Coast Arbitrator John Kagel in his Decision C-02-04 makes it clear that in order to claim conflict with the Agreement there must be a prima facie showing that the language in dispute conflicts with the PCLCD. Paying the Hall crane drivers the 2 hours extra that crane drivers get, plus the difference between Skill I or Skill II and Skill III crane pay in dollars, with no hours associated, and paying the day side steady men $55 per day under the table are clear violations of Section 4.32 and the Addenda, and constitutes fraud against the benefits that asses all hours paid. No assessments being paid for the extra crane hours, or the $55 per day paid to the day side steady men, has Coast wide significance as it relates to the low man out dispatch system as well as qualifying and paying for vacations, holidays, and medical benefits funding. The “Local 13 Crane Training Agreement” is NOT part of the PCL&CA. The Tentative Agreement is not signed by any Local 13 Officers, or any PMA members of the LA/LB JPLRC, was not printed in the Dispatcher as part of the MOU, was not put into the Los Angeles/Long Beach Crane Operator Addenda of the PCLCD, and has not been mentioned in any CLRC Minutes. Stop paying the $55 per day to the steady men, and the guaranteed crane pay to the hall crane board when they work other than a crane job, Monday through Friday, and send everything back to the CLRC to be properly negotiated and included in the PCLCD. For the Employers to continue doing what they are doing constitutes an ongoing violation of Sections 4.31, 13.3, 18.1, 24.2 and the Guarantees, Skilled Rates For All Longshoremen And Clerks Addenda of the PCLCD. « Is the Local 13 Crane Training Tentative Agreement part of the PCLCD, or a phony “hip pocket” Agreement? It’s a simple question Jim. It’s really sad an uneducated boy from the hood has you afraid to allow comments. Especially when the question is simple. How does one obtain status on the “Supplementary crane board”? Who are you trying to kid? You are a steady crane operator and Chris Viramontes’ partner. Why do you want to know how to get on the Board, won’t Chris tell you?